Submitted by Taps Coogan on the 17th of January 2019 to The Sounding Line. 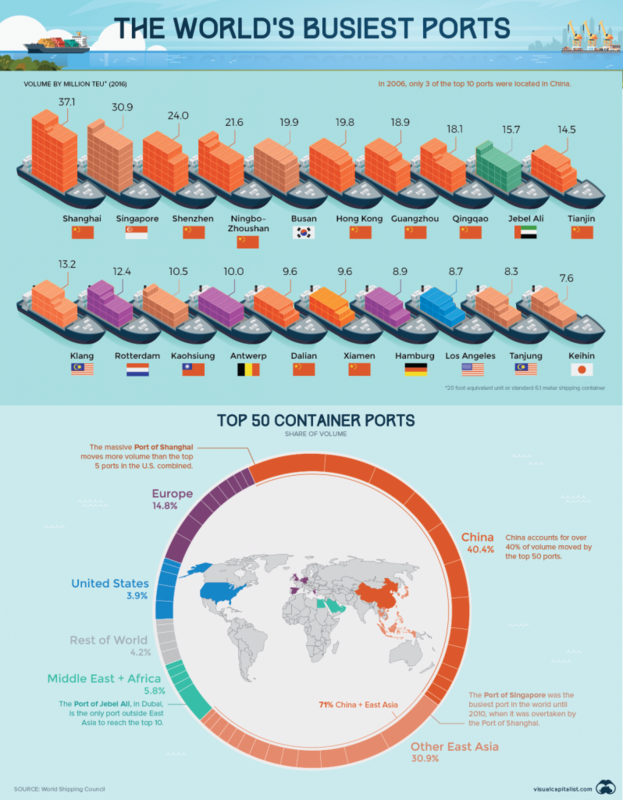 The following infographic, from Visual Capitalist, reveals which ports around the world handle the most container volume. It is estimated that 90% of all international trade is transported by ships and that 70% of the busiest ports in the world are now in East Asia. China alone is home to nearly half (40%) of the 50 largest container ports in the world, with the Port of Shanghai handling more container volume than the top five ports in the US combined. The fastest growing ports are similarly all in China and Malaysia, while Hong Kong and Singapore have seen volumes shrinking. All of which goes to highlight just how impactful the dramatic slowdown in China’s economy is going to be for the global economy. I work in a US port and many of the container ships are already below capacity or carrying empty containers to reposition them.